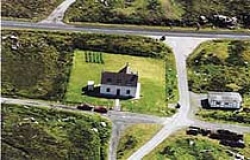 Situated near the centre of the island and close to the wonderful west coast beaches & Machair. Good fishing and hillwalking close by. Evening meal provided on request. From Benbecula airport, follow A865 main road south. We are approximately 16 miles from airport. Follow A865 to Stoneybridge . We are 100 metres off the main road.